iVillage Social Solutions brings Indian folk art to life by embroidering beautiful ethnic designs on utility products including home decor, gifting and apparel. You can browse through their Delhi store filled with handcrafted products, delivered straight from their production centre in Bulandshahr. They even offer you a warm cup of coffee and an enlightening insight into how the initiative has made a positive difference in the lives of hundreds of girls and women based out of UP. 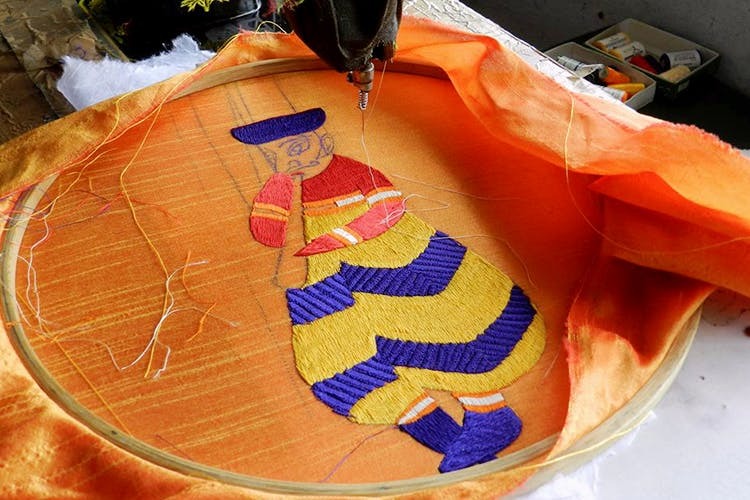 The brand focuses on facilitating women empowerment through skill development – the women force they employ is trained in hand and machine stitching and embroidery. The result is a whole world of handcrafted products ranging from saris and scarves to bed covers and wedding presents. If you’re keen, they might even agree to take you to their production centre in the village, and let you interact with the rural women working with them- it’s heartening to see how confident and independent they are! There’s a whole bunch to stuff to appreciate here but for writers like me, diaries with lovely hand-embroidered designs are a must have.